How in the world is it Wednesday already? Two more days and then we’ll be entering the weekend! Woo! 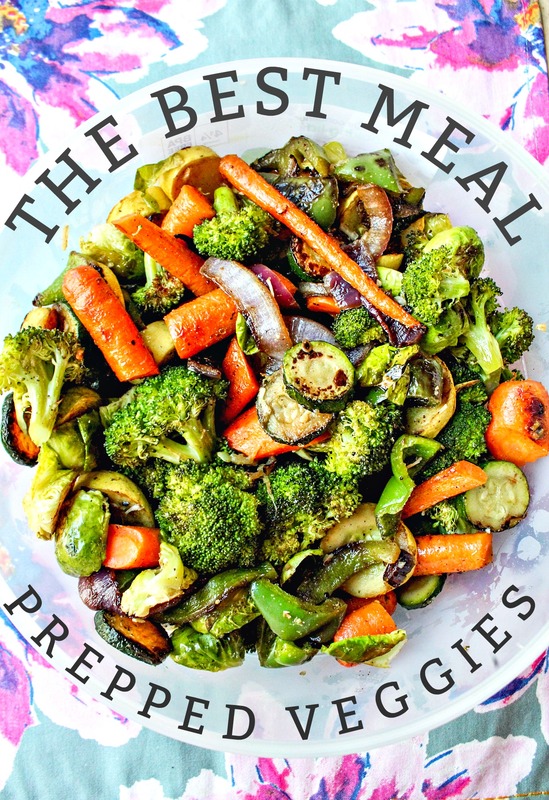 Before I take off for my doctor’s appointment (the one that has been rescheduled twice now because of weather), I wanted to share a little healthy tip, and my “how to” on my favorite meal prepped vegetables. I didn’t plan on doing a post like this today, but I received a lot of questions on Instagram after sharing some stories. I figured it would be much easier to do a post to explain it all. I wonder if any of you can relate to this. I once hated vegetables so much that I maybe ate three vegetables a year. If I did have them, it was because I added lettuce to my subway sandwich, bell peppers to a chicken fajita, tomatoes on a taco, onions on a pizza, carrots drenched in ranch, or onions mixed into my mom’s meatloaf. I HATED HATED HATED anything that fell into the “vegetable” category. I used to obstacle course around the veggies when my mom made chicken noodle soup. I’d practically gag if I accidentally ate a pea. When I set out on a weight loss journey back in 2009, I knew I was going to have to learn to like vegetables. I started with my mom’s sweet green bean recipe and then started introducing salads into the mix, then stir-frys, and so on. Eventually, I was eating vegetables like it was my job. I was roasting them, grilling them, adding them to omelets, passing up on the ranch, bringing them to school as snacks, and most of my diet consisted of straight-up vegetables. I still feel the same way about them. I genuinely LOVE them. My favorite vegetables are bell peppers, onions, any kind of squash, brussels sprouts, broccoli, kale, spinach, arugula, carrots, radishes…wait…I’m about to name all the vegetables, so I’ll just stop right there. I think the point that I’m trying to make is that you can train your body to like things. Start small, experiment, but don’t give up on vegetables. I love using my meal prepped veggies in pretty much everything. I’m currently eating an omelet stuffed with meal-prepped vegetables. You can top your pizzas with meal prepped veggies, add them to salads, eggs, stir-frys, as sides, in pasta dishes, and so on! It’s pretty much endless. Vegetables are filling, they have a lot of fiber, an excellent source of vitamins, and nutrients, and they are great for maintaining a healthy lifestyle. Preparing food makes your dinner/lunch/breakfast choices on the healthier side. It takes away the stress of thinking about what you’re going to make, taking the time to make it when you’re already hungry, or running to the store to buy groceries every night. It’s nice to have them all ready to go! When I meal prep, I find myself snacking WAY less, even if I’m working from home. And meal prepping doesn’t have to get out of hand. You don’t have to cook for the entire week (like my boyfriend), just make a couple of things that you find yourself eating most of the time. For me, hardboiled eggs, veggies, chopped fruit, and some kind of protein. If you have an issue with produce going bad, maybe try meal prepping the produce instead of letting it sit around. You’re more likely it eat it if it’s already prepared. Yesterday, I made some of my favorite vegetables to eat throughout the week! I used to roast everything in one pan, but I found out that they don’t all cook equally. There are some vegetables I like better sauteed, and some I like better baked. For instance, to me, onions are just so much better sauteed! I love the crispy glaze they get from the pan. They taste a little sour when baked, but that’s just me! I bake some and saute others. Some, I do both! 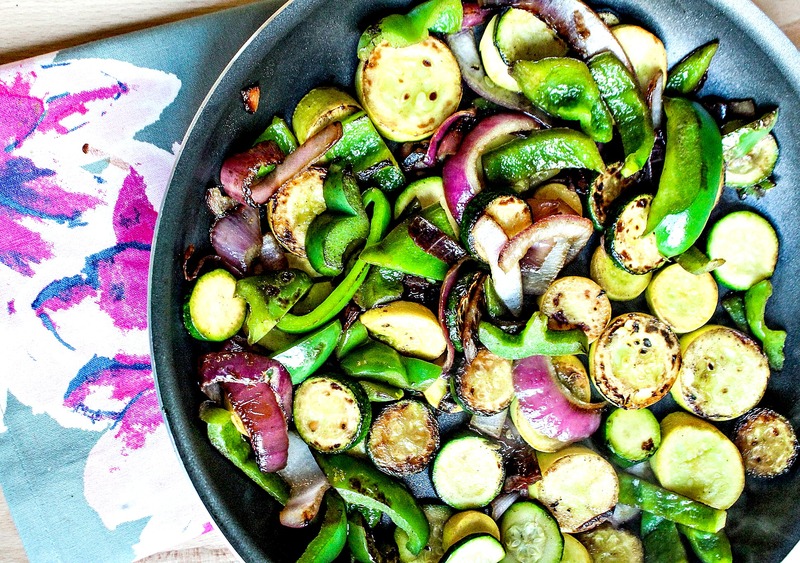 I have found that I like sauteeing onions, bell peppers, summer squash, and zucchini on high with a little olive oil in the pan. When I bake squash and zucchini, they get mushy if I don’t eat them right away. I love baked veggies, but not all of them are equally good when leftover. 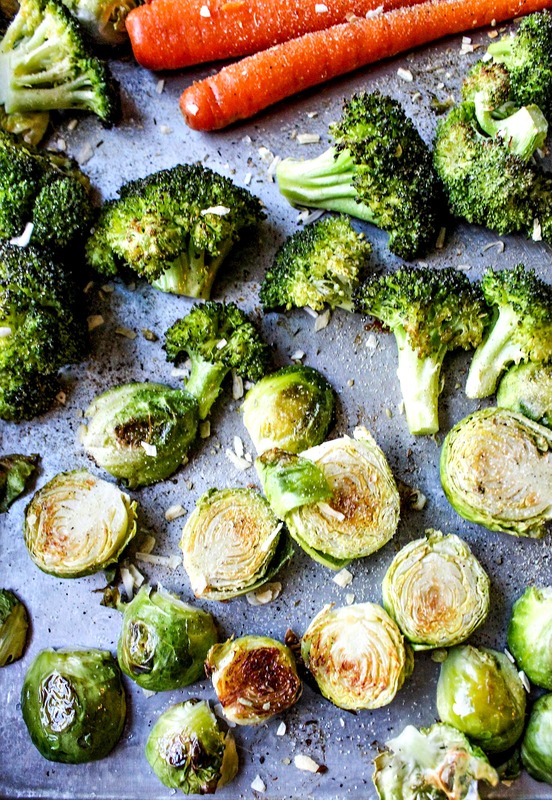 Brussels sprouts, broccoli, and carrots are so good when baked! I add them to a greased pan, spray them with coconut oil spray, sprinkle a little black pepper and sea salt on top, and bake them for 30 minutes at 400 degrees. I do take them out halfway and flip them! After the thirty minutes, I’ll use a spatula and add the broccoli and brussels sprouts to the pan with the sauteed vegetables. In a separate pan, I’ll finish the carrots on high heat for six minutes with a tablespoon of olive oil. I love carrots when they are golden and crisp on the outside. It only takes 35-45 minutes to prepare and cook these vegetables. That saves me so much time throughout the week! Even if I’m working at home, my time is still valuable. I can get much more work done on the computer instead of spending that time in the kitchen chopping vegetables at every meal. It does help me make smarter decisions when it comes to meal options. 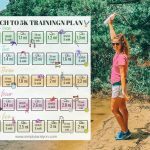 This has been the biggest help for staying healthy! Once all of the vegetables are together, I’ll sprinkle sea salt, garlic powder, onion powder, oregano, black pepper, minced onions, and Italian seasoning on top and give them a quick toss. I used to bake the seasoning with the vegetables, but the flavors are stronger when added afterward. When it comes to the grill, I LOVE ALL VEGETABLES ON THE GRILL. I plan on doing most of my meal prepping outside on the grill this summer. I usually cook them all up on a sheet of tin foil or a grill-safe pan. I store my vegetables in a large container in the fridge. Have you always loved vegetables? 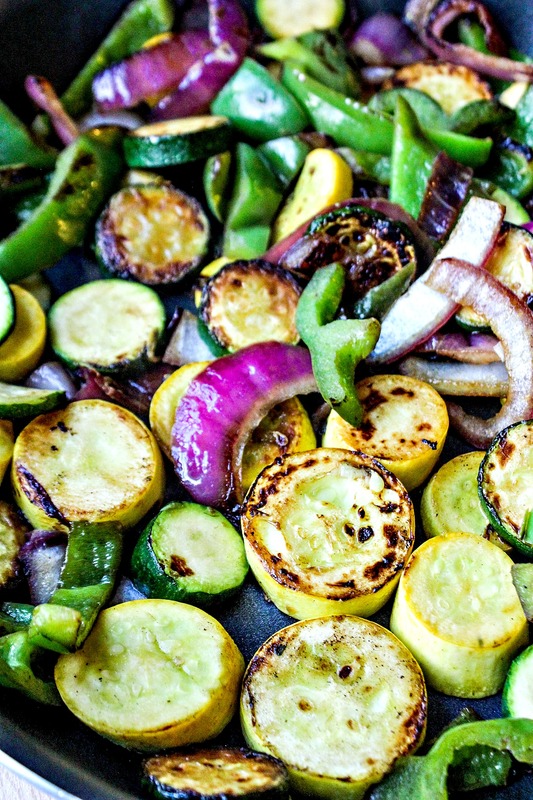 What is your favorite way to cook vegetables? Amazing recipe and it makes me drooling just by looking at the photos. Fresh veggies are the best. I believe a balanced diet that helps us to maintain our health. I used to hate eating veggies but now I’m enjoying every single one of them except some bitter veggies. Consuming veggies will help our digestion system as they lubricate our intestines. You should try using Mrs. Dash garlic and herb spice on your roasted veggies. It’s delicious and no sodium! I use that all the time! especially on my chicken! 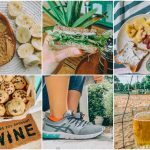 Your roasted veggie recipes and ideas have saved me! I have oral allergy syndrome so I can’t eat raw fruits or veggies during the high allergy season (which was horrible to find out because I love both!) and without all of your ideas I have no idea what I would eat! Thanks for always including the pictures! I never know what to pair my roasted veggies with and omelettes are such a great idea! I used to hate veggies too! Now they are my favorite thing to eat! I love roasting and sautéing them. I recently tried cooking them in my air fryer and they are soooo good that way! I love spending an afternoon chopping and cooking all of them and having them for the rest of the week…although they usually don’t make it to Friday! 1. I’ve never actually had an issue with Veggies – except Brussel Sprouts, Patty Pans & Basil (Herb) – but since going Vegan, I love’em all. 3. I like baking them, but I never seem to get it quite right… I’ll have to try your tips! I hated brussels sprouts until I made them fresh! The first time I had them they were steamed from a frozen bag! BLEH!!!! That is why you should always try something twice and cooked differently! xo xo hope they turn out! where do you buy your coconut spray? These look SO delicious!! Yum! You should do more posts like this. I love the way you eat! I think I’ve always been an adventurous eater, but two things I still can’t eat are CELERY and COOKED CARROTS. Well, I CAN handle carrots in a roast… as long as I have a *little* bit of ranch to dip them in. I don’t think I have a favorite veggie… I probably have a top five? Like, I LOVE pan cooked green beans in garlic… I love spaghetti squash and it’s super-versatility… and spinach and other leafy greens for being able to add to just about anything! Salads, mixes in my skillet, sandwiches, smoothies… the list is almost endless! 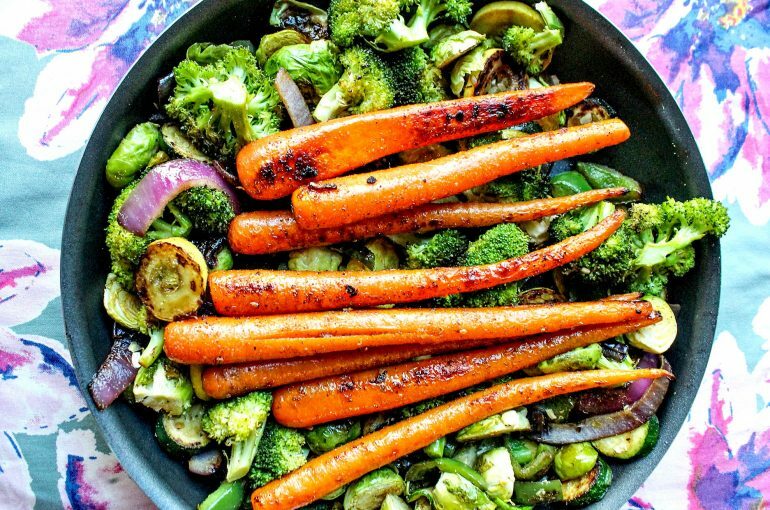 My favorite way took cook veggies is definitely in my cast iron skillet! I use a fresh minced garlic mix in the bottom of the pan with a little olive oil and cook on med-low heat until they are tender but crispy! This is my fav for almost every veggie!! Hahaha I LIVE FOR COOKED CARROTS! My friend, Meighan, HATES cooked carrots too! You can definitely train yourself to enjoy foods! I’ve learned that over the years. Those all sound like amazing faves! OMG THE CAST IRON SKILLET MAKES THEM THE BEST!!! I love love love veggies, I sometimes feel like they’re not ‘healthy’ because I love them so much. I love all the green veggies, zucchini, brussel sprouts, green beans & spinach. Only things I don’t like are mushrooms & raw tomatoes. I love sautéing my green beans with olive oil, himilaian pink salt & garlic powder. Get them a little seared & still crisp. So delicious. I also just did roasted Brussels with olive oil, salt, pepper & balsamic. Oh my! So much flavor! Lol I feel that way sometimes too! LIKE HOW DID I NOT EAT THESE BEFORE?!?! You named my fave! Glad you share the hatred for mushrooms with me! Your roasted vegetable suggestions have saved me! I have oral allergy syndrome so I can’t eat fresh fruits and veggies in the summer time during high allergy times, I never thought to roast them until you started! 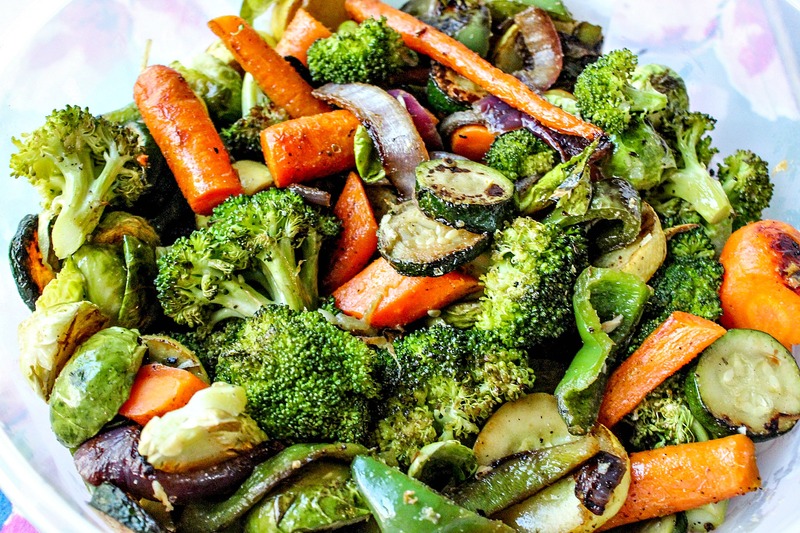 Thanks so much for sharing all the veggies you roast! Great Photos! The colors make me want spring! These look so GOOD! Can’t wait to try! I’m trying to work veggies into my diet. Not the biggest fan, but I want to try this. Not sure if this was already asked, but how long do the veggies stay good for in the fridge? I always eat mine up within a week! If you don’t think you’ll eat them all, put them in the freezer! I use them in eggs, stir frys, for sides, and even in soups! A lot of guys are like that! (and people) Just keep trying to make them for him! Even if you have to add cheese or ranch. Eventually, you won’t’ have to add them! Yummy I love roasting veggies! I’ve always loved vegetables! 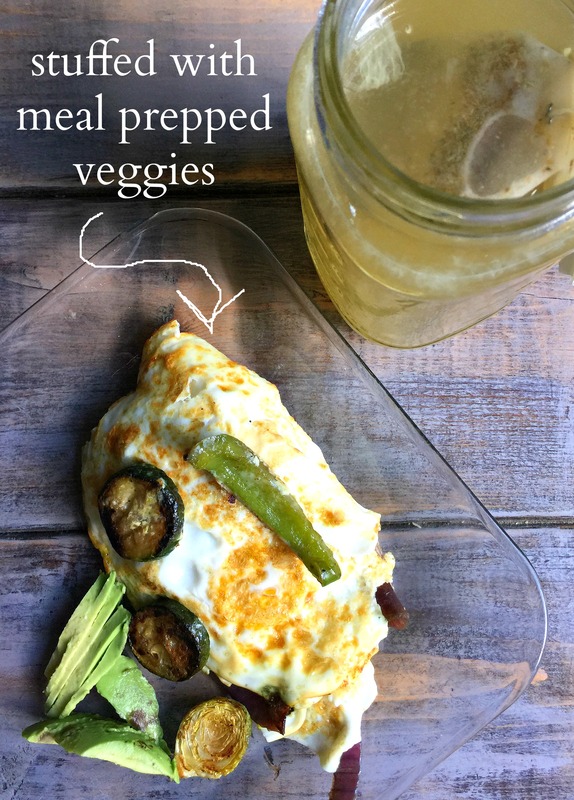 I love the idea of using the left over roasted veggies in an omelet I never really tried that, but I think I might today actually after seeing this post! 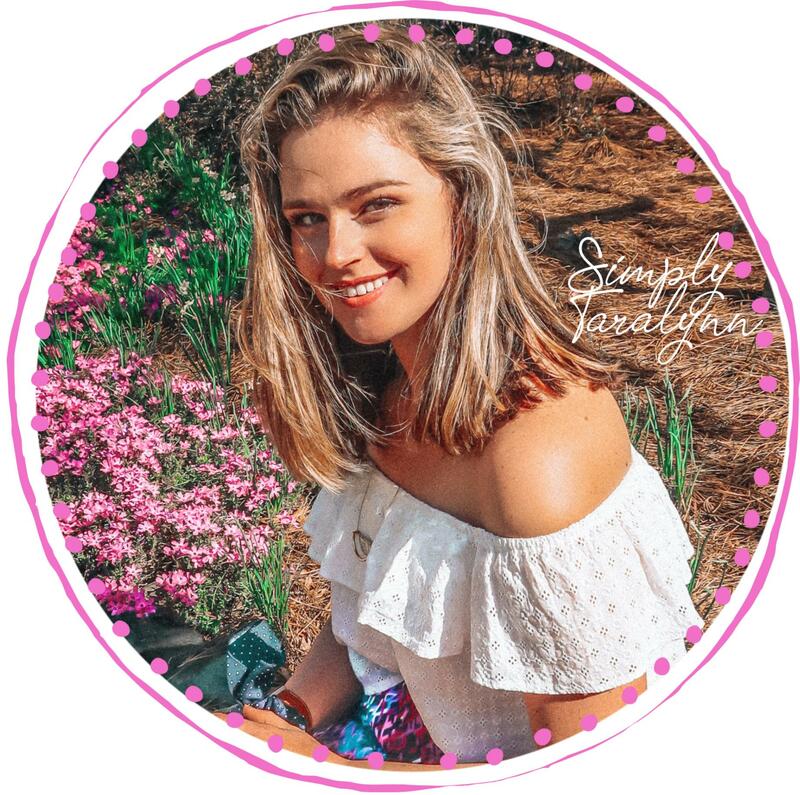 🙂 Thanks for sharing!!! I do it every morning with my eggs!! SO GOOD! I use to not be a veggie fan as a kid (I’d eat carrots but thats about it). I’m not sure what it was but as I got older I just started to like more and more veggies. Im at the point now that I actually crave veggies! I’m not sure why brussels sprouts ever got a bad rep because I eat them like candy now. Roasting is my go to method of making them as well with a little olive oil and little Tonys seasoning. I wouldn’t even eat carrots as a kid! I think brussels get a bad rep if you have them cooked the wrong way when you first try them! That is what happened for me! I used to HATE veggies too! I remember many LONG nights being at the dinner table alone trying to force down like, 5 bites of veggies haha. Now I LOVE THEM. There’s not a vegetable I won’t eat. I honestly can’t even choose a favorite because I’m obsessed. BUT, lemony green beans are pretty great all the time! This is super helpful though because I don’t utilize spices nearly enough when I make my veggies. I recently bought garlic powder and Italian seasoning after being inspired by your posts :). Can’t wait to roast some seasoned noms up! Hahahaha, sounds like me as a kid. I wouldn’t even eat them covered in cheese. MMMM Garlic powder is my staple in life. I love to bake my eggplant similarly, with Italian seasoning, and top with melted mozzarella, ricotta, sliced tomato/homemade sauce and Parmesan cheese! It’s a fantastic way to enjoy a healthy version of eggplant Parmesan alone as a small meal or even as a healthy appetizer for a party! You can even add a bit of Italian breadcrumbs for a crunch or serve it on some crust Italian loaf as a sandwich! Don’t they get soggy after they have been stored in the fridge? I always roast my veggies and i can’t cook more than what i eat in one sitting because they turn into a soggy mess the next day. Iv’e tried it before. Nope! Just make sure to eat them within a week! You can fry them back up or put them in the oven! 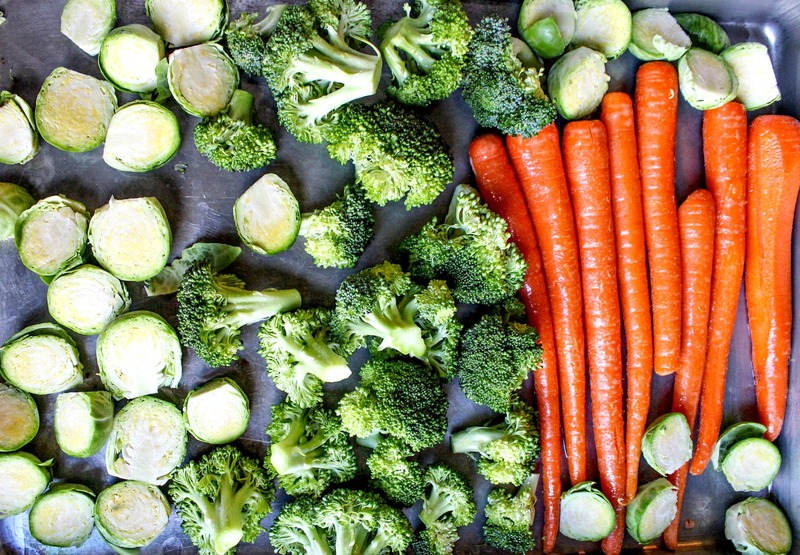 Choose veggies that don’t get soggy like broccoli, green beans, brussels sprouts, carrots, and onions! And if your veggie are getting soggy, you may be adding too much oil, or overcooking them! Lol I love them either way! I’m doing Whole30 this month and prepping veggies has been my savior. Need something in my eggs? Veggies. Made chicken and need a side? Veggies. It’s endless! I also prepped a vegan “cheese” sauce (basically squash, carrot, onion, and coconut milk cooked and blended) and I’ve been adding it to ALL my veggies. SO good! That sounds so good!!! Vegan cheese sauce would be ideal during the whole30! I had a cashew cheese that was so good once!! I’ve always eaten vegetables but I’ve definitely been incorporating them more the last few years. I’ve been roasting a bunch of veggies at the beginning of the week and making a big crockpot of shredded chicken. Then throughout the week I have a bowl of that and just add different toppings, I found a carrot miso ginger dressing at Trader Joe’s that was great with edamame hummus, or pesto and parmesan, or salsa and avocado. Its been a great way to eat a lot of veggies without getting bored. I also like to keep some quinoa on hand to throw in when I feel like I need more substance! Parm always makes veggies good. Broccoli with parmesan and garlic is my favorite. 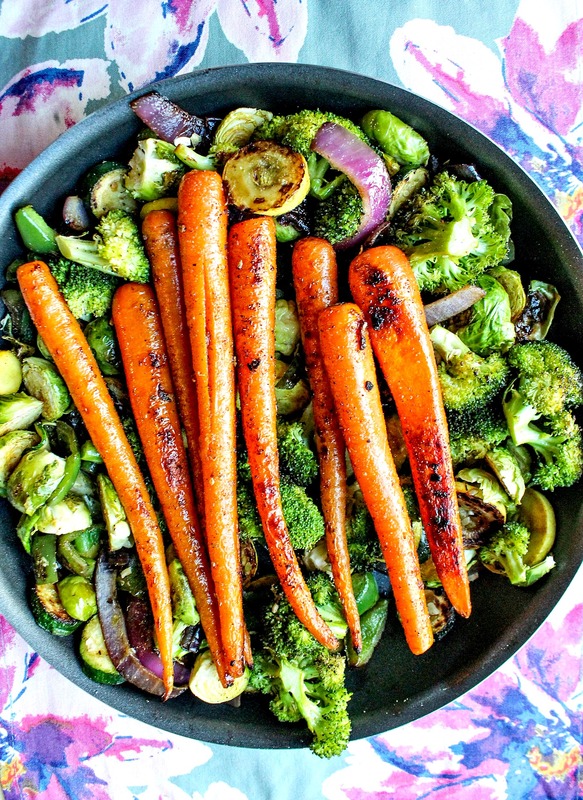 I’ve been loving ALL the roasted veggies! 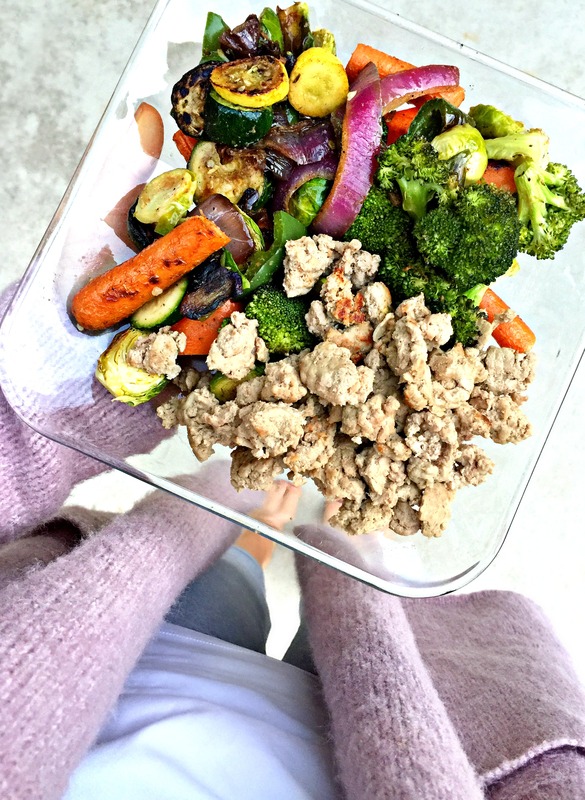 I make a big batch of them–this week I did, brussels sprouts, carrots, broccoli and sweet potato and cut up 3-4 of Trader Joe’s chicken sausage (I love the jalapeno and apple chardonnay), and roast them all together with different seasonings. Perfect for easy lunches to heat up at work! It’s also nice to come home to prepped food so you don’t need to worry about making dinner or throwing the first thing you see in your mouth when you walk into the door. Sometimes I top with avocado or a fried egg too if I’m extra hungry! They are just the best!!! Jalapeno and apple chardonnay say whuttttttt…. You MUST try them!!! They have so many amazing flavors and they are all so good! This is super helpful!! Sometimes the veggies I buy go bad in the bottom of the fridge, but I love the idea of having them all cooked up ready to go! Do you warm them up when you put them on your salad? I was seriously the same way as you with veggies..hated eating them plain and my only intake was exactly how you described it haha. I am trying to add more veggies now that I’m trying to be more conscious about where my calories are coming from, it’s so much easier to stay on track when I’m full from low calorie veggies rather than still hungry after eating higher calorie things. 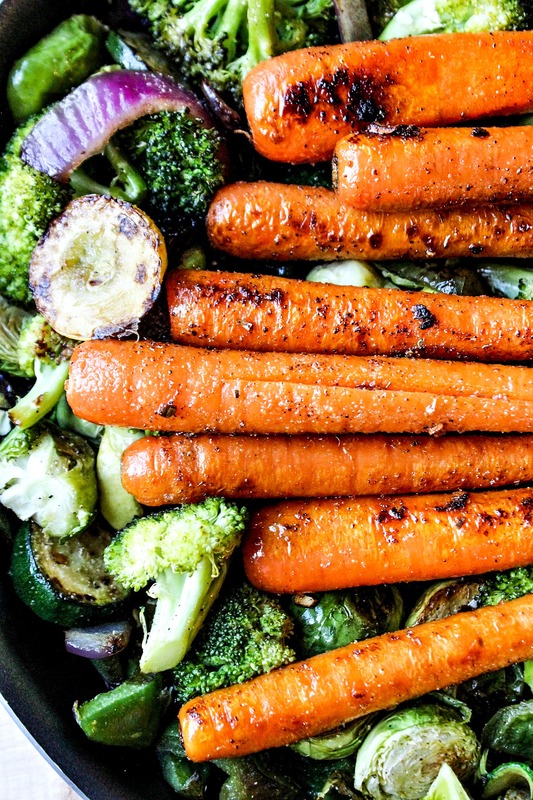 My favorite way to cook veggies is roasting them like you. Going to the store in a few minutes actually to pick up some to roast tonight haha! Lol it’s crazy how you can honestly train your body to like something! I agree! Last night, I was so full from veggies and lean protein that I didn’t even care about the chocolate bar hiding in the freezer lol It’s definitely a great way to stay on track. So glad you’re off to roast some veggies!! Thank you for sharing these healthy tips. It makes me feel good to know that you didn’t like vegetables from the start. I’m struggling with that right now. A Superfood Salad to Make Your Week Easy & Healthy!